Magellan RoadMate 1470 GPS powered by unique 4.7-inch color touchscreen and ultra-thin design, and delivering powerful navigation in a compact package. Magellan RoadMate 1470 GPS is easy-to-use device that gives you confidence while on the road with premium features, including AAA TourBook, highway lane assist, spoken street names, multi-destination routing, and pre-loaded maps of North America. The exclusive Magellan OneTouch personalized search icons let you easily bookmark favorite destinations so you can find them anywhere you travel. Find your favorite café or restaurant in any city with a single touch. 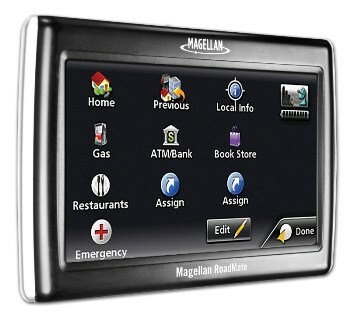 Magellan RoadMate 1470 GPS delivers your favorites at your fingertips.